58% av amerikaner med sympatier för Republikanska partiet anser att college och universitet totalt sett är negativa för landets utveckling. Hur påverkar man ett sådant opinionsläge? Hjälper det överhuvudtaget att tala förstånd med en folkopinion som verkar ha kastat allt vad förstånd och rationalitet vill heta överbord?1 Och vad skall vi annars göra? The next mode is magical thinking, or the open embrace of contradiction. The president's campaign involved the promises of cutting taxes for everyone, eliminating the national debt, and increasing spending on both social policy and national defense. These promises mutually contradict. It is as if a farmer said he was taking an egg from the henhouse, boiling it whole and serving it to his wife, and also poaching it and serving it to his children, and then returning it to the hen unbroken, and then watching as the chick hatches. Accepting untruth of this radical kind requires a blatant abandonment of reason. Klemperer's descriptions of losing friends in Germany in 1933 over the issue of magical thinking ring eerily true today. One of his former students implored him to "abandon yourself to your feelings, and you must always focus on the Führer's greatness, rather than on the discomfort you are feeling at present". Twelve years later, after all the atrocities, and at the end of a war that Germany had clearly lost, an amputated soldier told Klemperer that Hitler "has never lied yet. I believe in Hitler". The final mode is misplaced faith. It involves the sort of self-deifying claims the president made when he said that "I alone can solve it" and "I am your voice". When faith decends from heaven to earth in this way, no room remains for the small truths of our individual discernment and experience. What terrified Klemperer was the way that this transition seemed permanent. Once truth had become oracular rather than factual, evidence was irrelevant. At the end of the war a worker told Klemperer that "understanding is useless, you have to have faith. I believe in the Führer". Väldigt dystert alltsammans, men Snyder påminner oss om att framtiden inte är ristad i sten, och att vi genom att göra motstånd kan hejda tyranniets framväxt. Med anledning av Elon Musks senaste utspel om hur artificiell intelligens (AI) kan utgöra ett hot mot mänskligheten sände Sveriges Radios Studio Ett idag ett knappt tolv minuter långt inslag om saken, med start cirka 1:18:45 in i programmet. Medverkade i inslaget gjorde jag och AI-forskaren Fredrik Heintz, som jag faktiskt uppträtt tillsammans med i P1 en gång tidigare. En del blev sagt om behovet av att beakta säkerhet och risker, men inslaget hade kunnat bli betydligt bättre om programmakarna varit mer professionella såväl redaktionellt (diskussionen framstod som tämligen ostrukturerad och oförberedd från deras sida) som tekniskt (programteknikerna avböjde mitt förslag om att i förväg prova de olika möjligheter till uppkoppling jag har här ute i den obygd där jag just nu råkar befinna mig, ett beslut som fick uppenbara konsekvenser i programinslaget). Dessutom tycker jag att Fredrik avslutade det hela snudd på ovärdigt genom att reducera perspektivet på denna viktiga och för mänskligheten kanske avgörande fråga från det globala till ett snävt nationellt övervägande om att Sverige behöver skärpa sig för att hänga med i utvecklingen. Jag får trösta mig med att programledaren i alla fall gjorde lite relkam för min bok Here Be Dragons. President Trump's encouragement of violence against media he perceives as oppositional, which took place on Twitter last week, is just one of his many many steps on the slippery slope towards authoritarianism and fascism. These steps by him and his administration urgently need to be resisted. 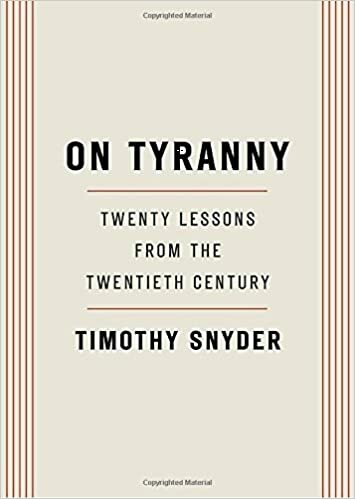 I know of no better guide to such resistance than the American historian Timothy Snyder's marvelous little book On Tyranny: Twenty Lessons from the Twentieth Century.1 The book contains exactly what the title says, thus drawing heavily on experiences from the twentieth century. It is generally considered bad manners to compare contemporary phenomena to counterparts in Nazi Germany, but I dont't think this particular code of polite behavior should be carried too far, as there are important parallels to be drawn between, e.g., Donald Trump and Adolf Hitler - parallels that we need to understand. Snyder does not shy away from this. His book is organized in the following twenty concrete lessons. 20. Be as corageous as you can. Then follows just a few pages elaborating and giving historical examples, and then on to the next lesson. The entire book is just 126 sparsely typeset pages, and can easily be read in an hour or two, but deserves to be read again and - for someone who's a slow learner like myself - yet again. I warmly recommend it - no, I insist you should read it. Doing so and learning Snyder's lessons is, at the current moment, most urgent for Americans, but Europeans (and others) should do the same, because we are not immune to the development that is currently most visible in the United States. 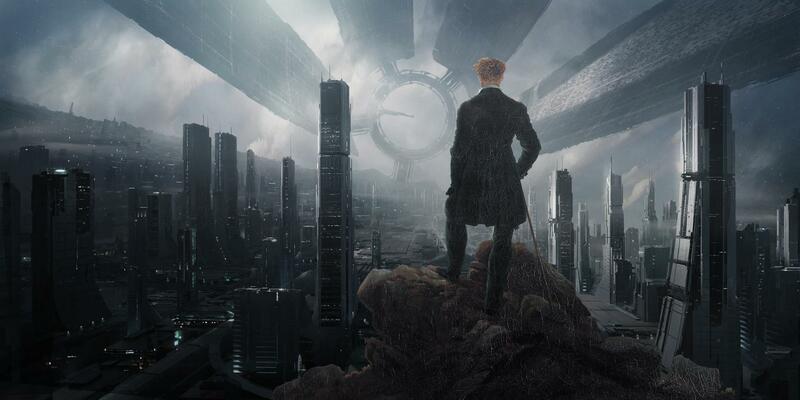 One day in the not-so-distant future, we may plausibly see a Marine Le Pen as president of France, and a Geert Wilders and a Jimmie Åkesson as prime ministers of the Netherlands and Sweden, respectively. Hungary is already there, and Poland is well on its way. When a government with an authoritarian inclination comes into power, we are in a better position to resist it the more prepared we are, and reading Snyder is one of the best ways to prepare. [This lesson] is number 1 for a bunch of reasons. [...] It is at the core of what historians understand about authoritarian regime changes: Nazi Germany in particular but also in general. Namely, that at the very beginning, whether it's the takeover in Germany itself or it's the Anschluss in Austria, [...] authoritarian leaders require consent. This is a really important thought, because when we think of authoritarians, we then think of villains and then we think of super-villains, then we think of super-powers, we imagine these guys in uniforms who can stride across the stage of history and do whatever they want. And maybe towards the end, something like that is true, but at the beginning it's not. At the beginning, interestingly, people will in a sense have more power than they do normally, because they have the power to resist. The problem is that we don't usually realize that. [...] We tend to [...] look for the new true north and align [our compasses] with that. We follow along; we drift. Most of the time that's appropriate, but sometimes it's an absolute disaster. See Lesson 1 in Snyder's book for a scholarly historical perspective on this, and for the remaining 19 lessons. If you are at all literate, if you care at all for liberal democracy, and if you can spare just a few bucks, then you have no excuse for not getting the book. Order it now. And then read it. Just do it. 1) Also very much reading is Snyder's 2012 book with Tony Judt: Thinking the Twentieth Century. More than once in the last couple of years, I've found myself wishing that Tony Judt were still around to help us navigate these difficult times. Alas, he isn't, but Timothy Snyder is among his best replacements.